Beer and football go hand in hand - don't believe otherwise! And I love drinking beers while wathing a football match! This is my personal list of the best beers to drink during football. It must be underlined that the list builds on my experience while watching footbal, and that they do not necessarily constitute what I consider the best beer! In fact, I have to underline that when I watch football, preferably in a pub, I prefer to drink draft beers - so many of these are drafts, but I will mention which ones I would prefer as drafts. 1) Stella Artois: A draft pint of Stella Artois is actually the best beer to watch football. I have greatly enjoyed it in Brussels and in London watching football, and it takes the top spot for being a delicious draft and good in pubs for great matches. 2) Kronenbourg: This is a delicious draft, but not available in most of the places I have been at. In fact, I only remember drinking these in Paris, one afternoon watching football by myself. 3) Tuborg Classic: This is the draft pint I usually get when watching football in Copenhagen. It is a fi ne beer, much better than the "normal" pint. 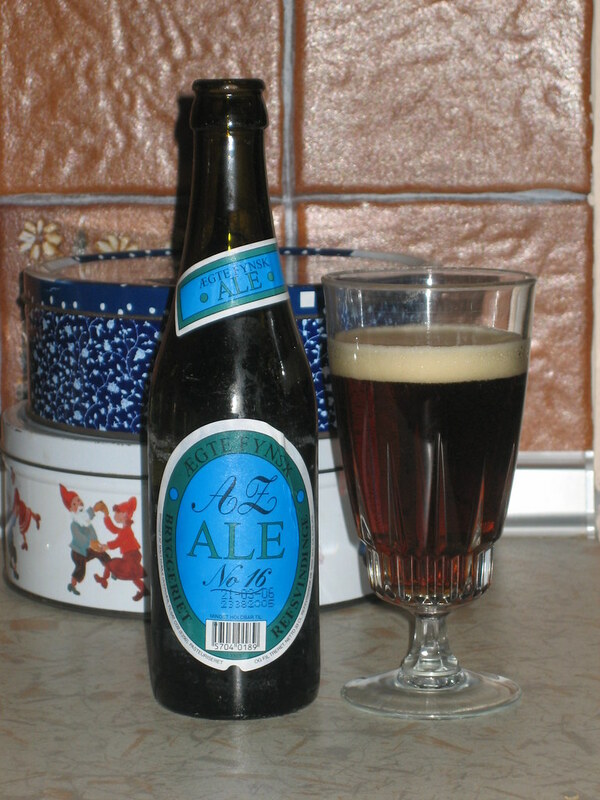 4) Carlsberg Special: In Copenhagen, if they don't have the "Classic", I usually drink this. 5) Refsvindinge Ale no. 16: My family lives in Fyn, near the brewery that brews these delicious ales, and it is therefore the only ones they drink. I have often had one or two of these when watching football at my parents place. 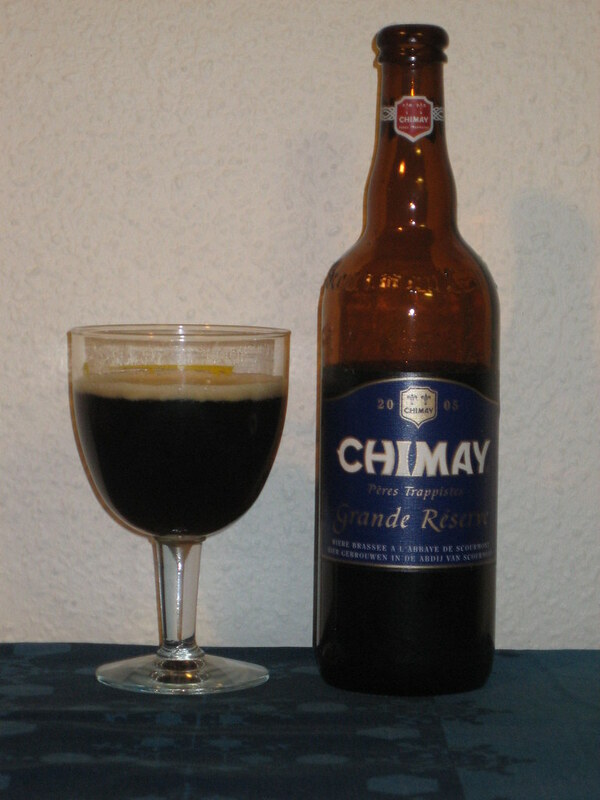 6) Chimay Blueu: This is a delicious Belgian beer, but is quite heavy, and I am unable to drink any more than two for a match, so it is usually not the kind of beer you have over a long match with many friends. It is best enjoyed with a great match where you don't necessarily support either team! 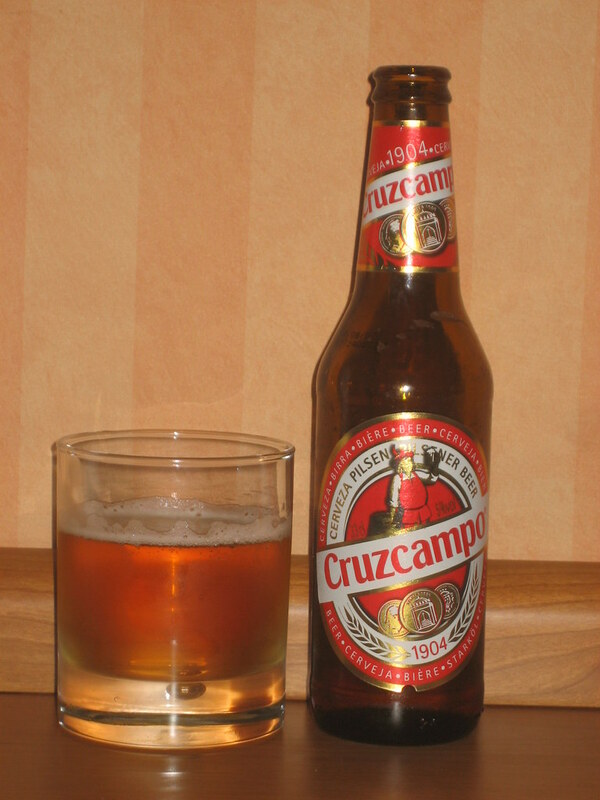 7) Cruzcampo: I have had plenty of these when watching football in Spain over tapas, a nd therefore, this beer is quite special for me. It is not the best in the world though. 8) Heineken: With a list that includes Carlsberg, it is surely necessary to include the Dutch champions league sponsors. Their pints are ok but somewhat borin, similar to the normal Carlsberg (which is why I normally drink Classic), but you can drink a lot of them! 9) Jupiler: I would often go to a pub near Schuman to watch football when living in Brussels, and I would always have "a pint of Jupe", meaning this beer, which is not bad, although it has a bad reputation for some reason. After the spectacular performance at the Confederations Cup I think there were great expectations to the US team as they went into the Gold Cup - the nearest thing to a Concacaf regional trophy. And the US seemed on the way to fulfill these expectations as they were to face the arch-rivals from Mexico in the final of the Gold Cup in front of 80,000 spectators in New Jersey. After 0-0 at half-time Mexico was awarded a doubtful penalty kick that Gerardo Torredo scored on. After this, the otherwise solid US side fell apart, and Mexico humilliated the US 5-0, winning on US for the first time this century! This fifth Gold Cup title is surely good for the Mexican's confidence as they struggle to qualify for the World Cup, while it is surely a huge disappointment to the US. However, I don't think this is necessarily bad for the US: as they have now been brought to the world's attention, they nevertheless need to keep their feet on the ground, and enter next year's world cup with some necessary humility, no matter how disappointing this match may have been. This was an extraordinary result, and I still think the US is a better team than Mexico overall. The Danish Superliga started last weekend on its season 2009-10, and already there have been some interesting results: My favourite Brøndby is looking even more disappointing than last season after losing to Esbjerg and 2-2 against OB. The Odense team is supposedly one of the strongest teams this season, and have also started well with the tie against Brøndby and a victory against Sønderjyske. The defending champions of FC Copenhagen started out with a surprising loss away to FC Nordsjælland, but this week they showed that they are still favourties for the title by smashing the new superliga team from HB Køge by 7-1. Køge is already on the way down. The other newcomers, Silkeborg IF started the league by 1-1 against HB Køge, but this week went to first spot by defeating FC Midtjylland 4-0 in a long-awaited local derby in central Jutland. Surely the ambitious FC Midtjylland must be in pain after such a thorough defeat! In Danish "Agurketid" means "cucumber time", to denote a period with almost nothing in the news. I guess these days are football-agurketid for me. Sure there are matches in the Libertadores, first round CL qualifiers, the gold cup, as well as numerous rumours about transfers (although most are about Real Madrid), but without some of my favourite leagues there is not much to talk about. Of course, this has been good for making some research on some lists I plan to do: top-10 beers to drink while watching football, top-50 World Cup goals, top-20 greatest World Cup matches. As I am spending some days in Århus, and today I ran by Århus Stadium, I thought I would look a bit into the major football team of Århus, AGF. Although they have traditionally been one of the major teams in Danish football with five Danish Championships and nine Danish Cup titles, as well as the record of 65 seasons in the Danish top league. In spite of this, the club has had disappointingly bad results ever since 1996, when they finished second in the league and won the Cup. This is of course hardly satifactory for a team with strong traditions and the second city of Denmark, and there have been investments in new players as well as in the new coach Erik Rasmussen, who had a succesful run as coach in FC Midtjylland. Although ending only 6th last season, I think most observers of Danish football would rank them as outsiders to do well, with players such as Jakob Poulsen, Peter Graulund, Ulrik Lindkvist, as well as some foreigners, including Englishman Mark Howard, the US national team player Benny Feilhaber. However, personally I think their team is too narrow, I hardly believe they will make it beyond 6th place next season. Anyway, I must have been really bored to start looking up things about AGF! This is my very personal list of 99 matches I can come up with, which I remember I have watched, remember the results, and the circumstances that I have watched it in. It is not necessarily in prioritised order; I have just listed them as I come up with them! 1) Denmark-Germany, 1992: I think every Dane remembers this match, the 1992 Euro final, where Denmark sensationally defeated the German world champions by 2-0 to kick-start the greatest party ever in Denmark. I watched the game in Ikast, where I was with family, before heading to Spain. 2) Argentina-West Germany, 1986: This was the world cup where I started following football, so many memories are from then. I had just been living in Argentina, and I was an eager follower of Argentina (and have remained so), and was more than happy to see them win 3-2. 3) Argentina-England, 1986: The legendary quarterfinal also meant a lot to me, who had been living in Argentina until then. And of course, who can forget Maradona's two moments in this match which ended 2-1 to Argentina? 4) Netherlands-Denmark, 1992: One of the most dramatic matches I feel I have watched, where a hard-fighting and brave Danish side defeated the Dutch super team of Gullit & Co. by penalty kicks after a 2-2 drama of blood, sweat and tears. In fact, I watched the game in Sweden, although not in the stadium where it took place. 5) Brøndby-Bayern Munich, 1998: I was in Parken when Brøndby made their Champions League debut against mighty Bayern Munich, and sensationally won 2-1 on Allan Ravn's incredible late goal. Brøndby lost the rest of their matches, and Bayern Munich didn't lose any more until the final against Manchester United! 6) Denmark-Uruguay, 1986: The Danish side in 1986 was amazing, and their 6-1 defeat of Uruguay was their most spectacular match. I remember being delighted at watching the match at my grandparents house in Denmark. 7) France-Brazil, 1986: I also watched this match at my grandparents. What was most impressive was the quality and level of these two teams that were surely two of the most talented of their generation. France won the game of penalties after 1-1. 8) Colombia-West Germany, 1990: I have Colombian background, and thus have a natural sympathy for the country, although they have never done really well. In 1990 they qualified for the World Cup, and in their last match in the first round they needed not to lose against West Germany to continue to the last-16. Colombia played a marvelous game, but Germany went ahead by Pierre Littbarski, until Freddy Rincon equalized in the dying minutes. I was at my parents place in Spain, and jumped up and down on the couch! 9) Brazil-Argentina, 1990: Argentina was not very good this year, and as a fanatic Argentina fan I was very nervous about them playing Brazil in the second round of the World Cup. Brazil was far the better team, but Argenina won 1-0 on a goal by Claudio Canniggia after a great play by Maradona. I jumped up in happiness at my grandparents place, where I watched the match. 10) Brøndby-IFK Göteborg, 1987: This is the first match I remember where I started becoming a Brøndby fan. It was the UEFA Cup, and IFK was one of the best teams in Europe, so this match was dubbed the battle for Scandinavia. Brøndby won 2-1 on goals I vividly remember by Claus Nielsen and Bent Christensen. 11) Valencia-FC Barcelona, 2000: This was an all-Spanish semifinal of the Champions League. I was in Castellón, north of Valencia, and watched the game in a local bar with a friend who was an avid Barcelona fan. I had a hard time hiding my delight though, since Valencia crushed Barcelona 4-1 and made it to the CL final! 12) Valencia-Bayern Munich, 2001: This was a devastating match for me. After losing the CL final the previous year, Valencia made it to the final again. I was in Copenhagen, but was travelling to Valencia on the following game, and watched the game on a big screen with my Valencia shirt. When Valencia went ahead, I was full of hope; when they lost on penalty kicks, I realized that God doesn't watch football! 13) Liverpool-AC Milan, 2005: Whoever doesn't remember this amazing CL final? 0-3 down, Liverpool managed to equalize and win on penalty kicks, of the most amazing final of recent times! I watched the match alone in a hotel room in Wa, northern Ghana, where I was working. I missed the penalty kicks, as connection suddenly disappeared, and I almost destroyed the TV in desperation! 14) Ghana-Czech Republic, 2006: I was on a beach in western Ghana for this match. We had to set up an extra generator for the match, who everybody was eager to watch! When Ghana won, a huge celebration ensued, and it was indeed very special to be watching this game in Ghana! 15) Ghana-USA, 2006: Not long after the previous game I was in Accra, and watched the match with friends in a local bar in Osu. The atmosphere was amazing in the entire city as Ghana won 2-1 and qualified to play Brazil in the last-16 of their first World Cup participation ever! 16) Borussia Dortmund-Juventus, 1997: I was writing a big university assignment with some other students and we agreed to stop work in the evening to watch this Champions League final, where the German side surprised by defeating the Italian favourites. Besides me winning 250 Danish Crowns in a bet, I remember Lars Ricken's late 3-1 goal for Dortmund. 17) Real Madrid-Valencia, 2000: A sad day, I could hardly speak to anyone at the university I was attending in Spain the day after Valencia had lost the final 3-0 to the arch-rivals of Real Madrid. Like all Valencia fans, I had been set for a massive party, just to be disappointed, and I actually stopped watching and went home and to bed after Real Madrid scored its third goal. 18) Real Madrid-Barcelona, 2009: I believe Barcelona in the 2008-2009 season is one of the best sides I have ever seen, and their superiority was cemented in the away match against arch-rivals Real Madrid in the Spanish La Liga, where Barcelona trashed the Merengues 6-2! 19) Chelsea-Liverpool, 2009: This quarterfinal in the Champions League was one of the most spectacular matches of the tournament ever! I went crazy while watching it at my parents place in Denmark, as goals seemed to be pouring down in this incredible and dramatic match which ended 4-4, and put Chelsea in the semifinal. 20) FC København-Brøndby, 2002: This is the modern classic in Danish football, and in the spring 2002 I went to watch this match in Parken in Copenhagen. Copenhagen had to win to get the title, and went ahead 1-0. In the last minute of the match, Mads Jørgensen equalized for Brøndby, who became Danish champions, and I was shouting in happiness with all other Brøndby fans! 21) Valencia-Manchester United, 2000: This is the best of the most boring matches I have ever seen. I was in the stadium, Mestalla, for the match, were a tie would see both teams go through in the Champions League instead of Fiorentina. The match ended 0-0, and fans from both teams celebrated it like a victory! 22) Spain-Yugoslavia, 2000: My experience with the Spanish national team was generally one of disappointment from Spanish fans, who preferred to support their clubs after so many disappointments of the national team. I watched this match in Spain with a bunch of Spanish friends (and one Yugoslav! ), and it was the first time I saw Spanish friends celebrate, when Spain won an incredible match by 4-3. 23) Manchester United-Bayern Munich, 1999: A legendary final where Bayern was the better team, and were winning 1-0 until the last minute where Manchester United scored two goals for a spectacular victory. I watched the game in my room at the student residence where I was living, and didn't particularly support either side, although most Danes were surely with Manchester, whose captain was Peter Schmeichel. 24) Valencia-Olympique Marseille, 2004: I watched this match in my apartment in Copenhagen, thinking of the celebration they might be having in Valencia. Of course, I was delighted to finally see Valencia take a European triumph by defeating the southern French by 2-0 in the UEFA Cup final. In the same weeks Valencia also took the Spanish title, so it was the perfect time to be a Valencia fan! 25) Italy-Denmark, 1999: I was living at a student residence in Denmark, and watching this Euro 2000 qualifier with everyone in the common room. When Denmark went down I left in anger to watch the match alone in my room, where I was nevertheless witness to the best comeback a Danish team has ever done: Denmark won 3-2! 26) Portugal-Denmark, 2008: Another great match by a Danish side where Denmark won a world cup qualifier against all odds and a superior team. Down 1-2 the Danes scored two goals in the dying minutes of the match to take the important 2-3 away victory! 27) Spain-Germany, 2008: Finally Spain won something! They had a great team and played excellent as they defeated Germany 1-0 in the final of Euro 2008. I watched the game in a small restaurant in Borgarness, Iceland, with some friends during a roadtrip from Denmark to Iceland. Earlier in the day, we had been rafting on an icy-river, and only the Germans fell into the water. 28) Turkey-Germany, 2008: The Turkish side was incredible in the Euro 2008, and in the semifinal against Germany also played a spectacular match that Germany won 3-2. I watched this drama in the bar-lounge of a large cruise-ship from the Faroe Islands to Iceland. There were many Germans on the ship, but not much of an atmosphere. 29) Argentina-England, 1998: Another of the classic matches between these two arch-rivals in the last-16 of the 1998 World Cup. An amazing goal by a young Michael Owen, a red card to David Beckham, and a 2-2 match that Argentina to my delight won on penalty kicks. I watched the match at my parents house in Denmark, and was carried away by the drama. 30) England-Germany, 1996: The Euro 1996 semifinal in Wembley was another classic between Germany and England. I was with some friends biking around the Danish island of Bornholm, but we found a local pub to watch the match. There were many Germans in there, but all Danes supported England. However, the Germans were the happiest, as they won the dramatic match on penalty kicks. 32) Denmark-Brazil, 1989: It was the 100th anniversary of DBU, so they prepared a friendly tournament in Copenhagen between Denmark, Sweden and Brazil. Although it was a Brazilian side with many reserves, Denmark won 4-0. Perhaps the game is most remembered for Michael Laudrup scoring with the head! 33) USSR-Netherlands, 1988: The Euro 1988 final saw the mighty Dutch win 2-0 an excellent victory against a strong USSR side (and this was the last time they participated as USSR in an international tournament), where Marco Van Basten's incredible goal from a very narrow angle stands out as the best moment. 34) Bolivia-Germany, 1994: This was the opening match of the 1994 World Cup. Germany won 1-0 on a Klinsmann goal. It was the day I graduated from Gymnasiet, and we were doing the horse-tour to everyone's home in and around Copenhagen. 35) Argentina-Romania, 1994: I was in Colombia, and watched this match with a cousin. I was of course supporting Argentina, which was not very popular in Colombia. It was a great match, although I was not too happy about the result; Romania won 3-2 and Argentina was eliminated from the World Cup. 36) Argentina-Cameroun, 1990: Another of those sad matches that I would rather forget. I was living in Spain, and had been looking forward to the World Cup, only to see my favourite Argentina sensationally lose the opening match to Cameroon. Although I thought that Cameroon didn't play well, this match spelled the entry of strong African teams into world cup football (although Morocco, Algeria and Cameroon itself had all had fine performances in 1986 and 1982). 37) Chelsea-Manchester United, 2008: A very dramatic but not too beautiful Champions League final in Moscow that had blood, sweat and tears. It ended 1-1, and Manchester United won the super-dramatic penalty kicks, where John Terry's miss must be one of the most famous misses of all time. 38) AC Milan-Liverpool, 2007: Hoping for a repeat of the spectacular 2005 final, this was a rather disappointing final that AC Milan won 2-1. I watched the match in a classroom at the Training Center for Development Cooperation (TCDC) in Arusha, Tanzania, where I was attending a training at the time. 39) Argentina-Netherlands, 1998: We were painting the kitchen in the student residence, but took a break to watch this World Cup quarterfinal. I was very disappointed that Argentina lost an otherwise excellent match, where Denis Bergkamp's winning goal for the Dutch nevertheless still stands out as one of the best goals in World Cup history. 40) Denmark-England, 2002: This was the last-16 of the 2002 World Cup and Denmark was hoping to outplay the English. With many friends I went to the national stadium, Parken, to watch the match on a huge screen, almost as being there! It was a disappointment though: Denmark lost 3-0 and was out of the World Cup. 41) Denmark-Sweden, 2004: Last match of the first round in the Euro 2004. The only result that would get both teams through ahead of Italy was 2-2 - and that is what it ended! In spite of the Italians complaining about foul play, it is doubtful, as both teams went for the victory, but when the score was 2-2 just five minutes before the end, neither team understandably risked anything. 42) Valencia-Arsenal, 2003: Valencia had to win against Arsenal to continue in the Champions League, and managed to get a 2-1 victory that put Arsenal out. I watched the match in a bar in Accra, Ghana, in my Valencia shirt. What made the victory better was that an Arsenal supporter had been very obnoxious and unpleasant during the entire match, only for me to taste the sweet victory! 43) Spain-Denmark, 1993: Denmark could not lose, or would not qualify to the 1994 World Cup, while Spain had to win to qualify. In spite of everything going Denmark's way, Spain won 1-0 on a goal by Fernando Hierro. It was devastating, and at my Danish High school where I watched it on a large screen, many bottles were broken in anger at this result. 44) Argentina-Denmark, 1993: My two favourite national teams played this match in Buenos Aires between the South American and European champions. I watched it in my Danish boarding school, and supported Argentina, as I could not let go of Maradona! The match ended 1-1, and Argentina won on penalty kicks. 45) Lyngby-Silkeborg, 1993: Having lived in Silkeborg, I had an appreciation for the team, and while studying in Birkerød, I would go to Lyngby games. So I went to this Danish league game which ended 2-2 on a cold day. Silkeborg eventually won their only Danish league title that season. 46) Lyngby-Brøndby, 1999: This was the last match of the season in the Danish league, and I went to watch it with some friends. It was also a match that had international observers due to a curious mathematical invention which had resulted in Lyngby actually having to lose in order to qualify for a tournament the following year. The international observers were there to find that there was no foul play as Brøndby won 5-2, and every single fan was delighted! 47) Brazil-Denmark, 1998: After defeating Nigeria, Denmark was to play mighty Brazil in the quarterfinal of the World Cup, and gave the Brazilians a tough fight in an outstanding match, only losing 3-2. I watched the game with thousands of other fans in the Central Square in Copenhagen, where the atmosphere was electric when Denmark went ahead 1-0 by Martin Jørgensen in the early minutes of the match! 48) Denmark-Nigeria 1998: Nigeria had been the revelation of this world cup, and were behaving somewhat arrogantly before facing a Danish side that had been quite poor in the first round. However, the Danes destroyed Nigeria 4-1 in a marvelous match where Ebbe Sand's goal on a pass by Michael Laudrup stands out. I watched the match at my parents place in Denmark. 49) Brøndby-Barcelona, 1998: I went to watch this Champions League which Barcelona won 2-0 without problems. Nevertheless, the match is perhaps most remembered by Pep Guardiola's red card, as he attacked John Jensen, who five years before had viciously slaughtered Guardiola in a match that had left Guardiola out of football for a long time. 50) Barcelona-Manchester United, 2009: The outstanding Barcelona team played around with Manchester United in the 2009 Champions League final which I watched at a friend's house in Copenhagen over beers and bets. Barcelona won 2-0, and little Lionel Messi scored on a header! 51) Spain-Ukraine, 2006: I was on a roadtrip through Ghana with some friends, and this was a particularly difficult day, where leaving Mole National Park early in the morning, we drove through a thunderstorm. We made it to Sunyani in the afternoon to watch this match in a local hotel over lunch. Spain played excellently and won 4-0! 52) France-Italy, 2000: I watched this Euro 2000 final at some friend's house in Barcelona. I was totally supporting the French, and was delighted when Wiltord equalized for France in the last minute, and France winning after extra time! 53) Roma-Real Madrid, 2001: September 11th 2001 is perhaps mostly remembered for a more important and tragic event. I was at a friend's house in Copenhagen watching this Champions League match which Real Madrid won 1-2 (an important away victory! ), while we would switch over to watch CNN in half-time. 54) Galatasary-Arsenal, 2000: I was studying in Spain while this UEFA Cup final was being played in Copenhagen, which I was sad to see suffering the ravaging of hooliganism before the match. I watched the game in a local bar in Benicassim with an Irish professor, and saw Galatasaray deservedly win after penalty kicks. 55) Italy-France, 2006: I watched this 2006 World Cup final in my favourite spot in Accra, Duncans, where it rained like crazy as the game ended 1-1, Zinedine Zidane was red carded, and Italy won on penalty kicks. 56) Manchester United-Villarreal, 2005: I watched most of this Champions League match on the waiting room of a clinic in Accra, where I was waiting to be tested for malaria. The test came out positive, while the match ended 0-0. 57) Liverpool-Juventus, 2005: I went to the Sports bar Champs in Accra to watch this match after a long day at work. Liverpool won 2-1, made it to the Champions League semifinal, and I relaxed with football and beer. 58) Norway-Brazil, 1998: I watched this game at my student resident in Denmark, and I was incredibly annoyed that cynical little Norway could defeat mighty Brazil, and I promised I would never watch football again (it lasted about a day...). 59) Spain-Poland, 1991: Spain's and Poland's Olympic teams played this friendly match in the town of Ronda, which I went to watch with many friends. It ended 1-1, was a horrible match, and nobody could imagine that these team would go to the Olympic final in 1992. 60) Spain-Poland 1992: The Olympic 1992 final, which Spain won 3-2, and which I watched on TV in Ronda, where I had seen these two teams play barely a year before. 61) Czech Republic-Denmark, 2004: The Czechs were amazing and destroyed Denmark 0-3 in a Euro 2004 quarterfinal that was a huge disappointment for Denmark. I watched the match in a pub in Copenhagen, but besides a lot of beers, not much to remember. 62) Spain-Denmark, 1986: A match that I am sure most Danes would rather forget. I stopped watching at 2-1, and left crying... The spectacular Danish side was humiliated by Emilio Butragueño, who with four goals, cementer Spain's 5-1 victory in the World Cup's last-16. 63) USSR-Belgium 1986: I think this is the first match I remember for scandalous refereeing and the realization that justice and football refereeing are very vague concepts. It was the last-16 of the 1986 World Cup and a splendid USSR side was playing a Belgium-Anderlecht side. Belgium won 4-3, and three of the Belgian goals were patently off-side. 64) Ikast-AGF, 1986: The only reason I remember this match is because it was the first I ever went to. AGF won 0-1, and won the Danish league that year. I managed to get an autograph from the goalie Troels Rasmussen. 65) Ikast-Groningen, 1989: The first time I went to an international match was this UEFA Cup match in Ikast, which Dutch Groningen won 2-1. 66) FC Porto-Monaco, 2004: I think what most people remember from this Champions League final is the surprise that these two teams were the ones who made it to the final. FC Porto under José Mourinho was the far better team and was outstanding in the 3-0 victory which I watched in a pub in Copenhagen. 67) West Ham-Liverpool 2006: I had been on a night plane from Accra to Nairobi, and after lunch with a friend in the Kenyan capital, I returned to my hotel very tired, switched on the TV, where this FA Cup final was starting. In spite of being tired, I was unable to sleep during this splendid final, which ended 3-3 and Liverpool won on penalty kicks. 68) Brøndby-Manchester United, 1998: One of Brøndby's CL matches that I went to watch in Parken. After defeating Bayern Munich, Brøndby fans like myself were full of hope, but there was nothing to do against Manchester United, who won 6-2. 69) Czech Republic-Germany, 1996: The 1996 Euro final is remembered for the surprising Czechs, whom I would have loved to win, and the fighting Germans, who deservedly won on one of the only "Golden Goals" in football history. 70) Portugal-England, 2000: I watched this splendid match of Euro 2000 with a group of international friends in Castellón Spain, which included both English and Portuguese. Food, wine and fun made the atmosphere great! It was also a great match, which Portugal won 3-2, and I particularly remember a splendid goal by Luis Figo. 71) Brazil-France, 2006: Nobody expected the ageing French team to do well against Brazil, but they won a well-deserved 1-0 victory. I watched the match with a French friend in the pub Champs, in Accra, Ghana. A particular funny incident was when a French lady on another table got somewhat annoyed with me as I made a funny comment about French President Chirac: "Don't you support the French?!" 72) Liverpool-Chelsea, 2008: John Arne Riise scored a late own-goal in the CL semi-final to give Chelsea a good position before the second leg with 1-1. I watched the match in a pub in Nampula, Mozambique, as I was starting to drive from Nampula to Mozambique. 73) Barcelona-Manchester United, 2008: I was eager to watch this CL semifinal on my drive through Mozambique, and found a hotel in Quelimane, where I was able to watch it on a small scratchy TV. It ended 0-0, and eventually Manchester United progressed to the final in Moscow. 74) Denmark-Sweden 1989: As part of the 100th anniversary of DBU, Denmark destroyed the Swedish arch-rivals with 6-0! I was just happy, although the match didn't say much of the level between Sweden and Denmark. 75) Valencia-Zaragoza, 2000: Valencia was splendid in the 1999-2000 season, and this was the last home match of the season, only a few days before they were to play the Champions League final. I was in Mestalla with 50,000 other fans, to celebrate the team, and say goodbye to "Piojo" Lopez, who was playing his last match for Valencia. Valencia won 2-1, and Piojo scored. 76) Spain-Uruguay, 1990: This World Cup match ended 1-1, although Spain played poorly. However, I remember it as I watched it with some friends in Ronda, Spain, and got into a big argument since I was certainly not supporting Spain. 77) Italy-Argentina, 1990: This was a very dramatic semi-final of the 1990 World Cup in Naples. Italy had everything going for them, including a very sympathetic referee who had some questionable calls. Still, Argentina, not playing well but fighting hard, managed 1-1, and eventually won on penalty kicks, thanks to the splendid goalkeeper Goycoechea. 78) Danmark-Hungary 1994: I was in the stadium, Parken, in Copenhagen for this friendly match which Denmark won 3-1. However, what I remember this match for was my vain attempt at getting an autograph from the legendary Ferenc Puskas, whom I had spotted among the spectators. 79) Brøndby-Widzew Lodz, 1996: Another of those matches I would rather forget, but still remember for the sad emotions I went through. It was a CL qualifier, and Brøndby had lost 1-2 way. At the home-match, they went ahead 3-0, and everything seemed perfect until the Poles scored two late goals that put them in the Champions League. 80) Silkeborg-AGF, 1996: One of the few matches I have been at in Silkeborg Stadium. The reason I remember this, and Silkeborg winning 2-1, is because I played on it before the match (to make it a bit more exciting) and won 400 Danish Crowns. 81) England-Sweden 2006: I watched this match with some Danish friends in the bar Champs, in Accra Ghana. We were the only Danes, and decided to root for Sweden, singing Pippi Langstrømpe and ABBA songs, much to the dislike of the largely pro-English audience but much to our own drunken amusement. The match ended 2-2, and is perhaps most remembered by Joe Cole's incredible goal. 82) England-Paraguay, 2006: England won 1-0 in this World Cup 2006 match that was also the first match we watched on our Ghana roadtrip, at a small spot near Akosombo. 83) Chelsea-Barcelona, 2009: Chelsea played a good and disciplined, but way too tactical match against the brilliant Barcelona team. Although the referee was very bad, it was nevertheless well-deserved when Iniesta scored a beautiful equalizer for 1-1 in the dying seconds to put Barcelona in the final against Manchester United (that they eventually won). 84) Valencia-Liverpool, 2002: I was in Accra and went to Champs in my Valencia shirt to watch this Champions League match. Before the game started, a guy in a Liverpool shirt told me that Liverpool would surely win against such Spaniards. But he was wrong: Valencia was far superior to Liverpool and was leading 3-0 at half-time on three splendid goals. The Liverpool fan left at half-time, and Valencia decided not to score any more goals. 86) FC København-Brøndby, 2009: A hugely disappointing match where arch-rivals FCK destroyed Brøndby 4-0. Brøndby was a huge disappointment the entire season, and this just underlined it. I stopped watching the match at 3-0. 87) Silkeborg-AaB, 1994: I had lived in Silkeborg, so it was nevertheless a bit of a special feeling for me when Silkeborg won their only Danish championship in 1994, after defeating AaB 2-0. I watched the match on TV in my boarding school in Birkerød, and I must admit that I celebrated when Heine Fernandez scored the second for SIF. 88) Real Madrid-Juventus, 1998: Real Madrid won the 1998 Champions League final 1-0 on a goal by former Valencia player Pedrag Mijatovic. I watched the match in my student residence. 89) Denmark-Spain, 1988: Both Denmark and Spain were poor in Euro 1988, but gave each other an interesting match which Spain won 3-2. Michael Laudrup's goal gave hopes that Denmark might pull a good result against the Spaniards. 90) Denmark-Wales, 1987: The Danish team had decayed after the 1986 debacle, and was having some difficulty qualifying for Euro 1988. It came down to this last match against Wales, which Denmark won 1-0 and barely qualified. I believe this was Preben Elkjær's last goal on the national team. 91) Hearts of Oak-Asante Kotoko, 2005: I went to watch this first leg of the African Confederations Cup between the two Ghanaian teams on a boiling hot day in Accra. It ended 1-1 and the Accra side Hearts of Oak eventually won the tournament. 92) AC Milan-Barcelona, 1994: A spectacular AC Milan side defeated a poor and tired Barcelona side 4-0 in the least dramatic Champions League final ever. I watched the match in boarding school in Birkerød, and vividly remember Savicevic's goal where he lifted the ball over Zubizarreta from a distance. 93) Chelsea-Manchester United, 2007: I watched this boring and disappointing FA Cup final in a small bar in Arusha, Tanzania, after I had been walking around in the heat trying to find a place to watch the match. Chelsea won on a Didier Drogba goal in extra time. 94) Ghana-Italy, 2006: This was also part of our Ghana-roadtrip, and on this day we had driven from the Volta region to Mole National Park, where we watched Ghana's first World Cup match ever. It was somewhat disappointing, as Ghana lost 2-0 to the later world champions in spite of not playing that bad. 95) Turkey-Croatia, 2008: These two teams have always been entertaining and this Euro 2008 quarterfinal was no exception. After a long match, Croatia went ahead 1-0 in the last minute of extra time, but then Turkey equalized in the dying seconds, only to win on penalty kicks. I watched the dramatic match with some friends in a half-empty pub in Viborg, Denmark, over many beers. 96) Denmark-Croatia, 1996: Croatia's excellent team's rise to fame came in the Euro 1996, where they thoroughly defeated the defending champions of Denmark by 3-0. Of course, as a Dane it was disappointing, but I was charmed by the Croats whom I have since always had certain sympathy for. 97) Ghana-Nigeria, 2003: The only time I went to watch a national match in Ghana was this friendly match between Ghana and Nigeria. It wasn't a good match, and I am not even sure I remember what the match ended (I think it was 1-1). But the most memorable thing was that they had forgotten to play the national anthems at the start of the match, so instead played them in half-time. 98) FC Porto-Bayern Munich, 1987: An excellent European Champions Cup final which FC Porto surprisingly won 2-1 (never underestimate Porto! ), and I particularly remember Madjer's goal with the heel! 99) AC Milan-Juventus 2003: I watched this game in a pub in Copenhagen, and a few days later re-watched it on video as I was working as "shotter" for Viasat Sport, the TV channel. It was not a great match, and I would probably have forgotten it had it not been for this. Predictably, the match had ended 0-0, and AC Milan won after penalty kicks. I was just looking at some information on USA in the world cups and came across a mystery which I would like to hear if someone knows more about. The USA made it to the semifinal of the very first World Cup in 1930, in Uruguay, where they were destroyed 6-1 by Argentina. The other semifinal was between Uruguay and Yugoslavia, with Uruguay also winning 6-1. Now, according to official information, there was no game for third place, which was thus shared between the USA and Yugoslavia. However, according to a 1984 FIFA bulletin (which I have not been able to find, but have found some references to, notably from RSSSF), there was a match for bronze, which Yugoslavia won 3-1! How can there be no information on this? What about some notice in a Uruguayan newspaper from the time, or, even better, some of the players that played back then? Of course, most have probably passed away, but some of them became great players and passed away at an advanced age, and might be able to tell something? I found that Aleksandar Tirnanic was the young star of the Yugoslav time and coached Yugoslavia in the World Cups of 1954 and 1958, and only passed away in 1992. Bane Sekulic passed away in 1968, but coached Switzerland, Red Star Belgrade and Juventus, while Blagoje Marjanovic passed away in 1984. Of the US players there is even more information, as there has been controversy on whether they were actually legit to play, as many were important Scottish and English players. The point nevertheless is: don't any of these people or their descendants have any information on this forgotten match? I would love to hear if anyone has any information!